Ravi Subramanian is good at writing thrillers. So far he has written banking thrillers only. Often he is referred as John Grisham of Banking (thrillers). Here are some of the banking thrillers written by him which we have reviewed so far. Then Ravi came up with The Bestseller She Wrote, which is a banking thriller but extensive part of the book explores non-banking arena as well. 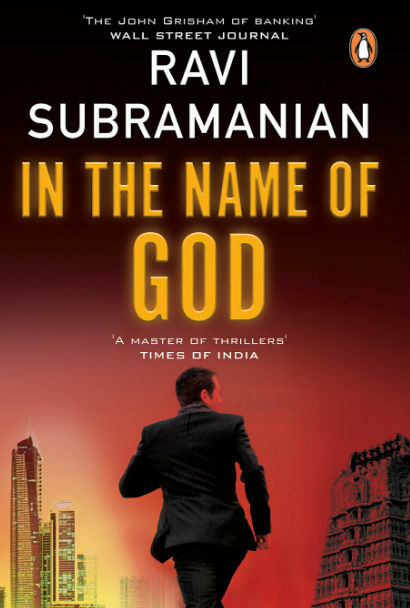 And now, Ravi came up with a nonbanking crime thriller in the form of a book – In The Name Of God. The main aspect to explore here is not that whether it is a banking thriller or not, but whether it is a thriller with substance or not. And the short and simple answer is, Yes. Nirav Choksi is a fellow who deals in jewellery and valuables. He is well respected in his entire business community for various reasons including his expertise, his honesty and his humbleness. He has only two priorities, his daughter Divya and his business. Divya is entering in her youth and eventually found her love of life in Aditya. However she was very clear on the priorities, in any case, her father is her first priority, and what he decided for her, will be accepted by her. No, no, don’t get it wrong! It is not a Hindi film love story where young lovers are madly in love and the father plays a villain! Nirav approves Aditya for Divya, as he found him honest, intelligent and a good human. It is discovered that in the Anantha Padmanabha Swamy Temple (in southern India) there are some vaults which are full of ancient jewellery worth millions or possibly billions or may be trillions of rupees (or dollars). As it was never accounted, no one can tell which is the right figure. The only thing known is, it is definitely a huge amount of money, which makes the Anantha Padmanabha Swamy temple, possibly the wealthiest one! The temple (and everything associated with it) is managed by Dharmaraja Varma, who is better known as Thirumanassu. He is the direct descendant of the king who built the temple. His ancestors have offered everything they own to the God and merely work as the trustee to him. Rajan, a citizen of the town, doubts that the wealth of temple is being misused or used by the king for his own purpose. Rajan considers the wealth, the property of the people. It should have been used for the purpose it was collected for, the well being of the fellow citizens, the needy ones. Rajan considers that, as the wealth is unaccounted, there is no way one can know the actual amount of it, and whether it is used/misused for any purpose. So he decides to knock the doors of the court to order opening the vaults and calculate the amount of wealth and eventually transfer the management of the temple and all its resources to the state government. In Dubai, there happens a robbery in broad daylight! During this tragic incident, the people associated with the jewellery store and a customer met with their deaths. While running away, one of the robbers fell on the ground, and before he successfully escape, there is one valuable drop from his bag (which is something he robbed from the store, of course). What was that and how these tracks are linked is the rest of the story. While exploring the story we meet with some interesting characters like Kannan, Kabir Khan, Krishnan, Subhash, Shreyanshi Sinha, Ranjit Dubey, Vikram Rai and others. The cover page of the book is thoughtfully designed. It makes the desired first impression to the reader. There are three parallel main plots are running together and if it is not a well-planned story, there was a chance to get the things messed up. However, Ravi is in full control of the story and the way the tracks and sub-tracks meet each other leads to the final conclusion is effective. If you analyse the books Ravi Subramanian wrote so far, you will know that there will always be a character named Aditya (which is a synonym of Ravi by the way) and he is often found vulnerable. This book is, without a doubt, one of the best thrillers of the year, and is the best thriller authored by Ravi so far. His previous book The Bestseller She Wrote has a remarkable amount of adult content (as eventually, it was about an adultery), which is absent here, and I really like it. The book moves with proper pace in the target direction, without any nonsense. The characters are built pretty nicely and the twists and turns at the regular intervals show different aspects of the characters quite interestingly. On one hand, the dialogues are simple and effective, on the other, they contain some philosophical gems and realistic life-lessons as well. The problem with lying was that while the first few lies were thought through, the subsequent ones tended to fall apart. That’s why no liar ever emerged unscathed from a sustained interrogation. Their ability to connect all the lies in a cohesive story diminished with every subsequent lie. And more often than not it is the personal stuff that leads to murders. So it might be too personal for you, but for me it is bloody work! Sometimes, when left to themselves and forced to introspect, even hardened criminals softened up. It was always the small frauds that lay the pathway for a larger malaise. If one paid attention to the small frauds in the system it became very easy to unearth the decay within. Convincing people to do what they think we don’t want them to do is also an act of genius, isn’t it? Someone once said that there are six reasons why a person commits a crime: love, faith, greed, boredom, fear or revenge. Often we like or dislike people not for who they are, but for the circumstances under which we first met them. And I did not want to endorse someone who had an exit option. When you are serious about a relationship, you willingly give up all exit options. You commit wholeheartedly. Often, in matters of death, rationality takes a beating. Love and fear often bring out the same reaction – compliance. It is always good to admire competition, sir. Helps you stay ahead of them. If you think what you are doing is right, do it even if the whole world is against you. If someone is not directly in your control, try to influence it… try to change it. But don’t let the consequences get to you. Anger invariably leads to mistakes. I suggest that you think calmly. The black Audi was furiously approaching in reverse, followed closely by the white one, their bonnets almost kissing each other. I would like to mention these lines especially, as they represent harsh reality in quite an effective way. A riot had broken out. This was a public sentiment they had failed to read. A power they had failed to assess. Rajan couldn’t understand what the brouhaha was about. Hadn’t they saved crores worth of public wealth from being usurped by the king? Why then this backlash? The description of places and surrounding is written based on research and imagination by the author in such a nice way that you can imagine the things actually being happened. As a writer, it is tough to write the visual experience in the convincing way that reader can re-build it in his mind. Ravi has done a good job here. The book could have been better if there is a glossary segment added at last. Also, the list of characters and brief info about them is desired. As we often see that for the international audience mainly, names of character are quite different than they come across in day-to-day life. Also, most of the readers are not able to finish reading the book in one go, they read it in segments, and often they lost track with characters. They then need to fumble through to get the links, in such scenarios, such briefing list is useful. Also, Ravi didn’t try to get everything answered, he left some minor stuff to logically imagine and concluded by the reader himself, which works more positive way than the negative in this book. There are some other points about the book I wanted to talk, but to avoid spoilers, I think it is better to leave them. We would love to give it 8 out of 10 stars. 1 .Madhavan is Digp whereas Kabir Khan is ADGP which is much higher rank.How can Madhavan address him by his name? 2.AGP handed over a piece of sheet to Krishnan.What rank is AGP in Police Hierarchy? 3.Krishnan patted on the shoulder not Vikram Rai former CAG.No one can dare to do so.